Slack is great for a lot of things: bots, private channels, custom emojis. Heck, with the help of Shift, you can also be logged into two workspaces at once. 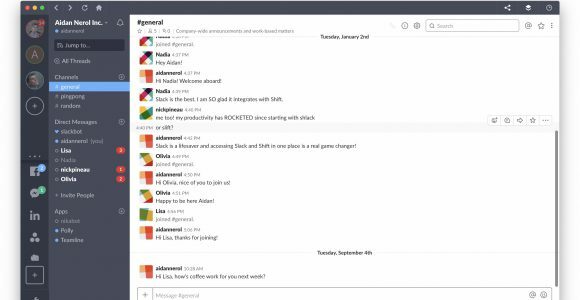 Slack slash commands are shortcuts so that you can do everything from invite new members to scheduling reminders for your team without leaving the workspace. Setting custom slash commands go that extra mile in making Slack feel like home. Here’s how it’s done. If you’re curious about what kind of Slack commands you can create, the sky is the limit. There’s a way to make it so that you get inspiring quotes delivered to your Slack channel simply by using the relevant command. Unfortunately, the actual creation of commands means you have to leave Shift. (Trust us: It sounds way more complicated than it is). Just head to https://api.slack.com/apps/new and go wild. Once you’ve created your app, you should see the basic information. Tip: Don’t use something generic like “/weather” – if multiple commands exist with the same keyword, only the newest will be triggered. Instead, go for something different. Here you get to change it up for your own amusement. Just like that, Slack becomes even more fun.